Should I Let My Kid______? It was a cold spring afternoon when my son asked if he could drive an hour the next day to visit his friend. Fairly new behind the wheel of a car, I hesitated. There were a million and one reasons to say “no” rolling around in my head and a few that said “it might be good for him”. I know he was wanting an immediate “yes”. After all, that’s what most teens do. They see the world as opportunity and want to seize every moment regardless of the impact on others or possibly themselves. Before talking with my husband I thought about the decision as I knew it was a crucial one. It would set a precedent for him and his younger siblings. My first thought was to go through my typical laundry list of questions. Is it safe and am I willing to take the risk? Are there things I’ve asked him to do where he is not fulfilling his responsibility well? Are there areas that I could/should tie this opportunity to for growth? Am I saying “yes” to make him happy or give him more responsibility? Would I be saying “yes” to make my life easier? Am I saying “no” out of fear? Given the circumstances which decision will bring about more maturity? After asking God to bring wisdom into the decision and talking with my husband, we decided the answer was “no”. And knowing how the emotional brain kicks in when we tell our kids “no”, I braced myself for my son’s response. He responded like most teens who could use some maturity. “You never” and “My friend gets to” and the “It will give me experience” came flying from his lips. Obviously upset my heart wanted to hug him and honor his request in spite of our reservations. After all, he did have some good points. However, my husband and I stood our ground in spite of his attempts to pull on our heartstrings. Three days later our son was still in a huff. We had done the circle discussion over and over with him as he continued to walk away frustrated with the decision as we stood firm. Little jabs were flowing from his mouth. I could tell he was trying to wear us down for the big request for the following weekend. I ignored the jabs at times and asked him to stop at others. I let him know that his behavior was not doing him any favors in showing his maturity. One evening at the dinner table it started again. I’ll admit that I wanted to walk away and not deal with the onslaught of comments; however, our son needed to know that we were firm on our stance and that he couldn’t bully us into changing our mind for the next weekend. But let your ‘Yes’ be ‘Yes,’ and your ‘No,’ ‘No.’ For whatever is more than these is from the evil one. My husband spoke in an even tone, calmly, but in a matter of fact manner that would let our son know that the discussion was over. He stated the facts from our position. He paused to let it sink in before he continued. We watched as our son worked to get his emotions and disappointment under control. Parenting decisions aren’t always easy and typically they are a judgment calls based on where we are in the moment. Do we want to be the fun parent? The yes parent? Are we making decisions so that our kids will be happy? Or are we making decisions that will help our kids mature in a way that lets them see how authority, boundaries, and responsibility can affect their world? Are we parenting toward a successful launch? She is clothed with strength and dignity; she can laugh at the days to come. So many times I make a decision out of my emotions in the moment rather than analyzing how this decision can impact my teen in a healthy way. I want my kids to think that I’m the cool parent. I want to be loved and I want to say yes as much as I can. Then there are times, Lord, when I say no out of fear instead of thinking about what is best for my child. I forget that you love my kid more than I do and that they are always under your watchful eye. Anything that can or does happen to my teen you have allowed. As I make decisions in my parenting, help me to do so with maturity, growth, and responsibility in mind. I want my kids to be successful in the adult world. I need to teach them responsibility and ownership of the things around them so they one day will be good citizens and good parents for their own children. Once I’ve made a decision, help me to not waffle as my teen tries to wear me down. Help me to be strong and courageous in this role you have blessed me with. May I always come to You for wisdom in every decision with my kids. In Your Son’s name. Amen. 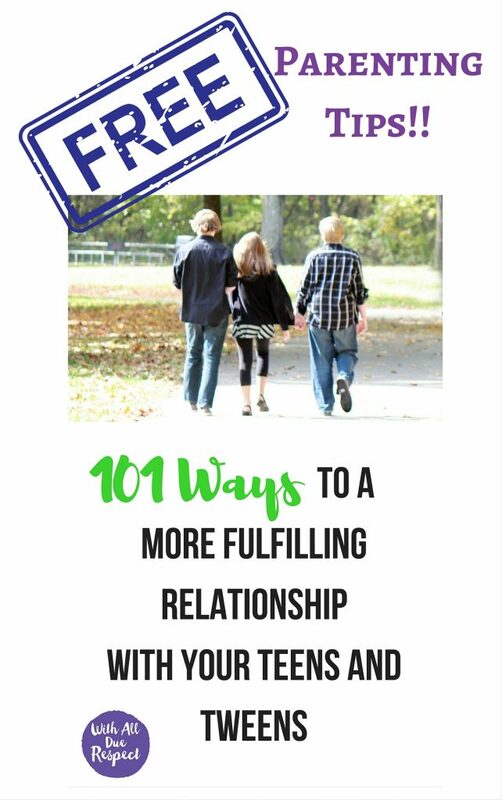 Saying ‘no’ to our kids can be difficult and raise the conflict in our homes. That’s why we at Greater Impact have designed a two day retreat called Deflating Defensiveness Training. The skills and methods we teach will help you turn conflict into connection with your kids and it will give you the skills to help settle your own emotion when your kids push back and try to lay a guilt trip on you. This experiential workshop will give you the confidence to parent with Strength and Dignity as God intended. Check it out! You’ll meet other Christian moms who come back time and time again because of the exponential growth experience and the impact it has had in their marriages and with their kids. "This book helps with insights on how to work through some of the roughest years most of us experience with our children. It leads you through self-discovery and real introspection on why you may parent the way you do. 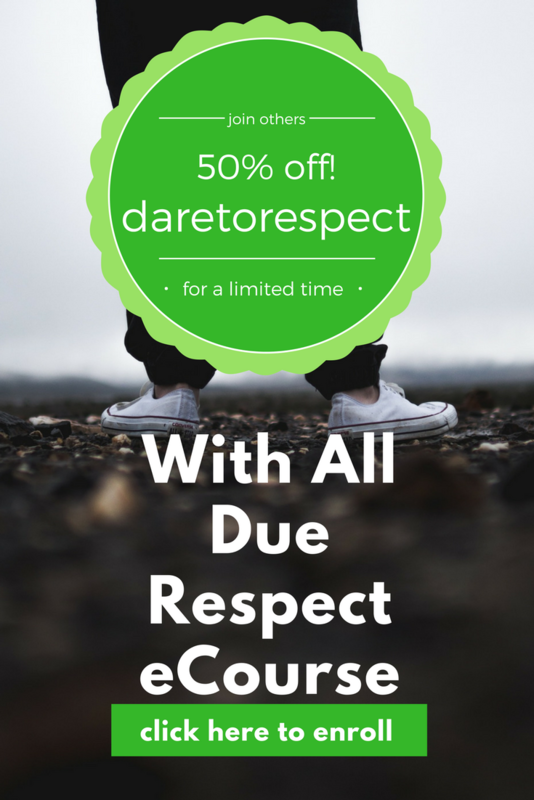 It takes you through real life scenarios and teaches ways to handle them in order to promote mutual respect. There is homework throughout and some "dares" to stretch you and assist with connecting more with your child. This book is soaked in prayer and based on sound bible teaching. It helped me tremendously and I am grateful for it. It will be a resource I return to throughout my parenting." ©2019 With All Due Respect ... by Debbie Hitchcock. Powered by the Get Noticed! Theme.